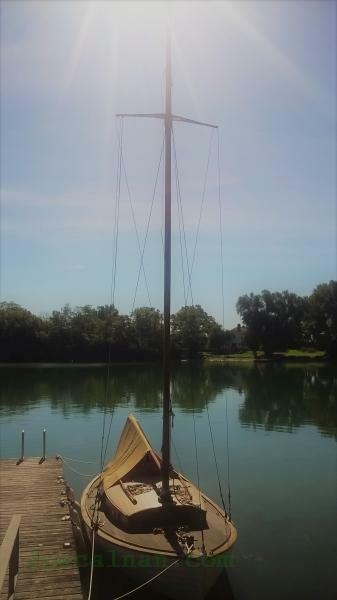 This KLB sailboat built in Copenhagen in 1936 still sailed with her original grown spruce mast until the top seven feet fell over the side in August 2016. Although the middle section of the mast was still sound, the top and bottom sections had already been repaired in previous decades and the owner decided to have a new mast built rather than repair the old one again. The mast is exceptionally tall and thin - 35 feet 2 inches tall and only 4 inches in diameter from the step to the spreaders, tapering to 2 inches in diameter at the cap. 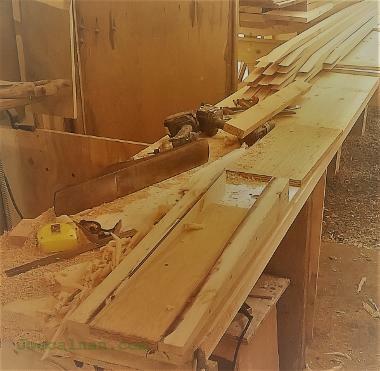 After exploring making a grown mast from a spruce tree and building a laminated solid mast, it was eventually decided to go with a hollow douglas fir mast. Once at the shop, all of the measurements were taken off the mast and turned into a scale drawing. It had been scraped down and refinished so many times that the original diameters had to be reconstructed from areas that were difficult to scrape - like under the hounds. 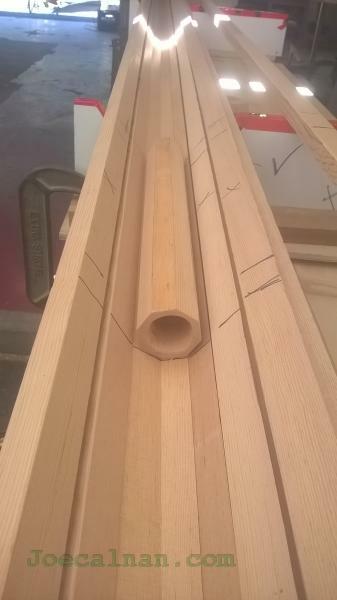 This graph gives the diameter of the finished mast for any stave width. It was used to lay out a pattern for tapering the top 20 feet of each stave. Another graph was made of the outside diameter of the points of the octagon. It was used to lay out the supports for the gluing jig. One support every five feet. the outside diameters of the octagons are laid out concentrically to cradle the mast and hold it perfectly straight while the glue cures. The extra width beside the cradle is for a work surface to support the staves while gluing up. 20 foot lengths of C & Better 8/4 Douglas fir were rough sawn into 1.25" thick vertical grain stave blanks. 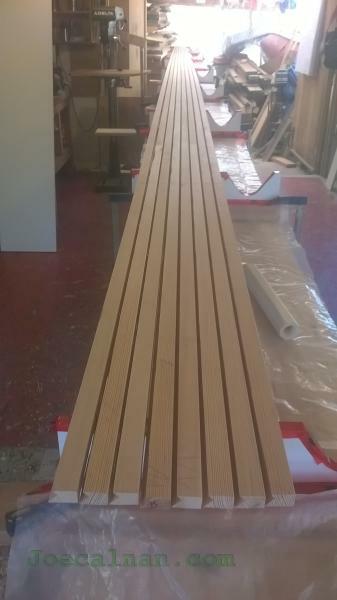 64 feet of infeed and outfeed tables allowed a final jointing and planing of the glued up staves to finished size. The dressed staves had the birdsmouth joint cut with a router bit from Lee Valley Tools. Because they were so narrow and delicate, it was cut in two passes. The taper was cut on each stave between the first and second pass. For thicker staves, the table saw at a 45 degree angle works well. 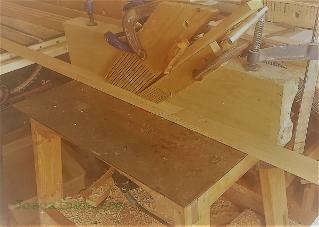 The taper was traced onto each stave from the pattern, rough cut freehand on the table saw, and then brought to the line on an improvised shooting board with a jointer plane. The staves were dry-fit on the gluing up jig to test that all joints were tight. The sawhorses are screwed to the concrete floor and topped with 2" boards. Final adjustment of the gluing jig was made using a laser level shot through multiple reference points including a 1/8" hole below the centreline of the mast. Internal reinforcements were fitted in way of the spreaders, the gooseneck and the step. They are bored with a 1" hole for ventilation, drainage, feeding wires, etc. The one at the step is teak for rot resistance. Glue up was with West 105 resin and slow hardener. A thin coat was rolled onto all internal surfaces to seal and wet out. A second coat thickened with microfibers was brushed into the birdsmouths. Zip ties pulled the glued staves together nicely. Hose clamps added extra clamping pressure where needed. 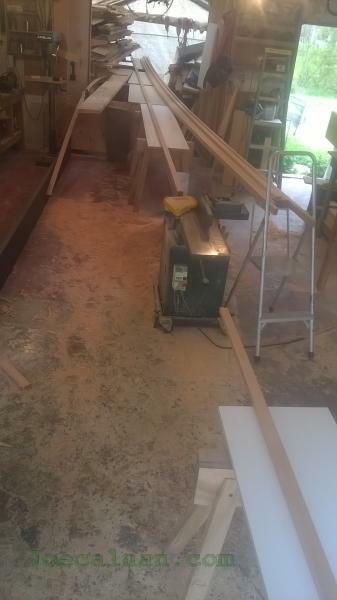 With the clamps removed, the excess epoxy was planed off with a jointer plane, bringing the mast to a smooth octagon. To mark the lines to guide in planing from 8 sides to 16 equal sides, make a spar gauge. The spar gauge is laid out by dividing a circle into 16 equal parts, projecting the needed lines up and transferring them to the centreline of the gauge. Pencils can be used instead of metal points, but are difficult to get accurate. The spar gauge rides along the mast, marking the lines to plane to. It is cut away so that only the centreline of the tool touches the mast. This keeps the proportions of the marks the same while the angle of the gauge changes with the taper of the spar. To get from 16-sided to 32-sided, spray very lightly with spray paint and then plane off the 16 apexes by eye, leaving 32 alternating stripes of equal width. Repeat to get 64 equal sides and then begin sanding. 100 grit sandpaper attached to the inside of slices of PVC pipe with a handle attached makes quick work of the final rounding. Pipe is easily available in 3", 4" and 6" diameters. Sand just until the paint is all gone. The hounds were hollowed the same way, using many light passes until they snugly fit the curve of the mast. Don't try this at home. And new cleats. The holes are drilled first, then the sides tapered, then the bottoms hollowed, then attached to the beveled offcut from tapering the sides with double-sided tape to hold them level as you band saw the profile. Leave them all in one long length until band sawing to final profile. The cleats are bored for #14 screws. The jig makes for accurate boring without having to measure & mark. The sail track seems to be the original installed by the builders in Denmark. It is solid brass and measures 5mm x 18mm. Some of it was damaged beyond repair when the mast broke, so a new section was made up using 360 brass alloy which machines very easily. The shape was copied as closely as possible using rotary files at low speed in a router table. Assembly time. Hounds and sail track batten on. Interlux Boatyard Bedding Compound is used between all joints. Mast cap and halyard sheave fitted. 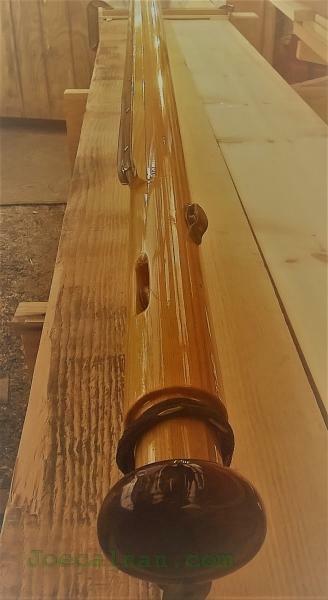 Shoulder cut for cap shrouds and forestay loops.